I’m thrilled to be part of the Tommy Nelson Mommy BloggerProgram! They chose a few select bloggers to review their products and offer giveaways to their readers, and A Beautiful Ruckus was chosen as one of them! Whoohoo! 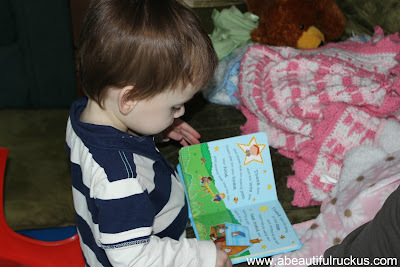 They are one of the top Christian publishing houses for children’s books and DVDs, so the chance to review and use their high quality materials with my kids plus offer them to you, is really exciting! April 30th is National Honesty Day, so that is the direction that Tommy Nelson went with this month's resources. While it’s true that my kids aren’t “telling” lies yet, it is obvious that they try not to get caught when they do something wrong. We have lots of kids books in our living room, and also a bookshelf with adult books on it. For some reason, the most interesting books in the living room are the adult books. We have tried to explain that they can read them when they are older, but they insist on wanting the books now. Unfortunately, they have paper pages. Paper pages and quadruplet toddlers don’t mix at all. 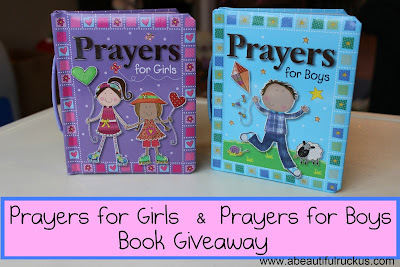 That’s why I was delighted to find the books Prayers for Boys and Prayers for Girls on their resource list! The book's simple poetry teaches kids that they can talk to God in every circumstance. For parents looking for an introduction to the idea of talking to God, these books fit the bill perfectly! Sean and I want our kids to learn that they can talk to God and that He is watching and cares about what they are doing. Those kind of lessons are important to start instilling now. The whimsical drawings are engaging and vibrant, and the handle on the board books make carrying them about the house easy. My kids love looking through the books…multiple times a day! In fact, when our package arrived in the mail, I had to get in line to look at the books myself. The kids took off with them as soon as I got them out of the box! Tommy Nelson has generously offered to giveaway one copy of each book. That means that this giveaway will have TWO winners! With one Prayers for Boys and one Prayers for Girls up for grabs, you will definitely want to enter this giveaway to get your hands on one for your kids! The contest ends at 11:59pm on Tuesday, April 16th. The winner randomly chosen and contacted by email on Wednesday, April 17th. The winner will have 48 hours to respond to the email with their information so that the prize can be forwarded to them. A Beautiful Ruckus is not responsible for the delivery of the prize and is not responsible if the sponsor does not deliver. This giveaway is open to residents of the United States. A Beautiful Ruckus received complimentary item(s) for review in exchange for hosting this giveaway from Tommy Nelson. No other compensation was received and all opinions are 100% my own. This post may contain affiliate links. For more info, please see my disclaimer page. So excited for this giveaway! We started doing bedtime prayers when she turned 1! Would love to have a copy of Prayer for Girls on our bookshelf! We pray before all meals, even when we are out at a restaurant. I want my children to be comfortable praying wherever they are and whenever they need to. I also want them to remember that everything we have comes from God and to show their grateful hearts! Thank you for the opportunity to get one of these cute books! My 4 year old prays before eating and at bedtime. We are also working on praying with immediate needs - like when someone is sick or hurt. Bed time has always been a bed time tradition to say prayer for those that we care about and things we are greatful for. My daughter was the first to initiate prayer at dinner so we have gone along with it ever since. We hope to teach our daughters how great God is and the amazing strength he can give us. I actually do not have children of my own yet, but I do have a large collection of children's books for the day that I am a mommy or a teacher (I have my degree in Elementary Education but cannot teach currently due to health problems). I do have a new baby nephew, though, and my best friend has a 2 year old boy and a baby girl, so I know a lot of little ones who would love these books. My toddler would love this. Yes, at mealtime and bedtime and sometimes in-between. Yes, at mealtime and bedtime and sometimes in-between! We pray at mealtimes and bedtimes! My little one is too small to pray but we do pray for her and will have her pray out loud when she is older. Thanks for hosting! We pray at mealtimes and bedtimes as well! Congrats on being one of the few selected bloggers to do the review & giveaway. What a great item kids. We pray before meals and at bedtime. I pray with our girls as part of our nighttime routine and I do it with each one separately (twins). If you try this with quads, your nightime routine might take more than one hour! My husband has a prayer that he says with J & E each night at bedtime. He's been doing it since the day we brought them home from the hospital. Even on the nights when he worked late, I would call him and put him on speaker so he could say it with/to them. Oooh yes! I encourage them to pray all the time, even if it's to tell Him what their thankful for, need help with, etc. Before we moved prayers were a daily routine. I miss our moments together with God and the kids. Hopefully we can get back on track when we move into our own place. Prayer is a huge part of our family and Christian Faith. I always encourage them to have a talk with Jesus for their every need. I would love these books for all my nieces and nephews that come over and play--and for my future children! When Ben and Deborah (my siblings) come over, we talk and pray every night before they go to bed. It's one of the most special times I have with them while they are over. These books may be a little juvenile for them, but regardless, I'd love to have them for when kids come over (which is often) and to read to my future children as well. Thank you again for another great giveaway! We say our prayers at bedtime. Awesome giveaway! We pray before meals and at bedtime. We also encourage our kids to pray during the day whenever they just need to talk with God Tessa A. My daughter prays at bedtime and at meals. We pray at meals and at bedtime, and whenever the need arises. Yes, they pray at bedtime. Grace listens to prayers at bedtime, but she's only 8 months and doesn't talk herself yet. My 17 month old son reminds daddy and I to pray before meals! The SECOND we set him nto his chair at the table he wants to pray. What an amazing blessing as a parent to see that in such a little one! We usually pray before bed as well, but that needs to be more consistent and not based on how sleepy he is! We pray at bedtime but have recently began praying before dinner to thank God for all our family blessings and to watch over our family far away and others. We pray with our 4 1/2 yr old son and 2 1/2 yr old daughter every day at bedtime. They love reading the prayer book they have. They would love to have a new book of prayers for each of them. Thank you for the giveaway. We pray before meals and bedtime everyday! my son is grown, with a family of his own. My niece & great niece are living with me, and this would be perfect. We do pray together, whenever we can! Our kids pray before meals and at bedtime. They say a prayer before each meal and before they go to bed each night. I pray at home but my Son no longer lives at home. He's grown. I'd like this for either my great nephew or great niece.